I occasionally think about trying out Twinity again, but then I get an email newsletter from them, and that invariably dampens my enthusiasm. The latest one announces a party at “Twinity’s first yoga & wellness lounge”, to mark “the launch of its new designer jewelry collection” (because every yoga and wellness lounge needs a designer jewelry collection!). I am urged to “come along to the party dressed in your finest clothes and take part in the most delicious avatar contest”. And apparently to illustrate a delicious avatar wearing the finest clothes, we have the memorable image shown here. Now maybe this is horribly lookist of me and I should be ashamed of myself, but… ewww! Grainy image, awful pose, dumpy clothing, and a necklace that looks like it was drawn onto the skin with a sharpie. I dunno what they’re thinking here. Normally I wouldn’t bother being mean to them about this, but the other awful thing in this particular newsletter makes me want to impose some sort of punishment. Jacko is alive & has been spotted in Twinity! Get a snapshot and win globals – be there at our “Paparazzi Time” on Thursday at 15:00 CET! I don’t think one has to be a Michael Jackson groupie to find this horribly offensive. Let’s simultaneously exploit our customers’ greed and the image of a recently-dead celebrity! Woo woo! R U HOT? is looking for Twinity’s hottest avatar! Spring arrives in Twinity! The best conditions to stroll through 3D Berlin’s streets and show off your avatar’s perfect appearance! If you would like a little extra hot topping with it, we have a special offer for you: R U HOT? in Twinity! At our first model contest you can watch stylish Twinizens parading down the catwalk showing some virtual skin. Be one of the first to see the hip outfits and hot beach wear for 2009! So in randomly clicking around the Web last night, I found myself on the signup page for Twinity, and I signed up. I was on OS X at the time, so couldn’t actually try it, but this morning on a Windows machine I came across the “you’re signed up, download now!” email, so I did that. I messed around for just a little while, not nearly enough to make much in the way of fair comments about the world, so I’ll make these unfair comments instead. Two things are immediately obvious. First, my hands are in a weird position. This is because I was playing with gestures / animations, and I bought and tried out the free “Bunny Hop” one, and couldn’t turn it off. Remember being a noob and not being able to stop dancing in SL? This was very similar, except even funnier because I was hopping everywhere, and less embarrassing because there was no one else around to see it. I logged off still hopping, but I hope when I log in again I will have stopped. Second, I look like a slightly-doofy middle-aged German guy. This is because (a) they make you choose a gender very early in the signup process, and there seems to be no way to change it later (sheesh, what’s up with that?) so I flipped a coin and it came up male, and (b) I messed around for quite awhile with the male appearance dialogs, which let you choose your appearance from a vast array of thousands or millions of possibilities, all of which look like a slightly-doofy middle-aged German guy. I think this is because the appearance dialogs let you fiddle with shape, but not with what SL calls skin, and the one default male skin is modeled after some middle-aged German guy (Twinity being a Germany-based thing, I think), who while probably fine-looking in real life looks slightly doofy when mapped onto polygons. There’s a thing you can do to make an appearance based on an uploaded picture, which sounds like one of those things that would be great except they don’t work. The very helpful support person who appeared in the support area about five minutes after I arrived told me about it, and I said it sounded kinda freaky and asked her if she’d done it. She said that she had, but didn’t have it active right now because she needed “a better picture”. Which suggests to me that in fact it doesn’t work. This isn’t really too surprising knowing how much skill it takes to make a decent-looking SL skin; the idea that a program could do it given a random snapshot of a face seems implausible to me. The obvious thing to do would be to take a good face-shot of Boy Dale from SL, and try uploading that and see what Twinity makes of it. 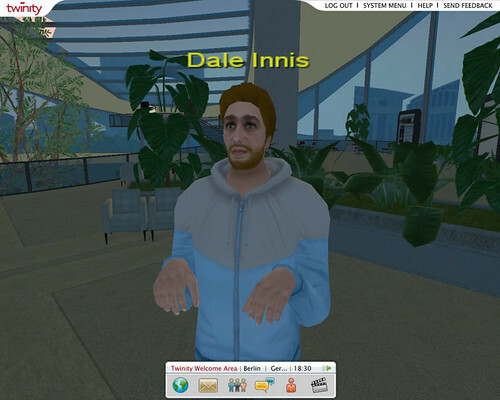 But, it occurs to me, if I take a picture of Dale wearing, say, Naughty Designs’ “Gabriel Early Tan”, and upload that to Twinity to try to automatically make a face-skin from, what are the copyright implications? The mind boggles. I ventured slightly outside of the Welcome Area, and there was a place with a fountain and some benches and stuff. I was unable to actually sit on the benches; all I could figure out how to do with them was find out that they are called “benches”, and report them for abuse. Fortunately they weren’t abusing me, so I didn’t have to do that. I would have liked to sit down, though. There was some amazing lag; at one point even with only like four people around (me, two other newbies asking how to change a shirt, and the nice support person), turning around got suddenly very jerky, and interacting with the appearance menus and things got very slow (not that it was ever fast). The support person said “Yes, we’re always working on the lag”. Don’t know what their underlying server sharding model is; ought to find out.